The Royal Sovereign RSL-2701 is a high quality 27 inch school laminator that can handle films from 1mil to 5mil thick. The RSL-2701 can be used with laminating film up to 27 inches wide and is commonly used in conjunction with standard 25" x 500' 1.5mil school laminating film. This laminator can laminate documents at speeds up to 7.9' per minute and is an excellent choice for laminating and encapsulating individual or multiple copies of posters, prints, POP signs, training ads, flexible signage and students work. The RSL2701 offers greater flexibility and features that are simply not available in other school laminating machines. Check out the RSL-2701 today. Fast - Laminates thermal film up to 27" (685 mm) wide at speeds up to 7.9' (2.4 m/min) per minute. Quality - High quality silicone rollers and digital controls for temperature and speed help deliver a perfect finish. Versatility -Designed for laminating & encapsulating individual or multiple copies of posters prints, POP signs, training aids, rigid or flexible signage and much more. Easy To Use - Soft touch digital keypad allows easy operation and function control. Convenient - Tabletop roll laminator is great for small working areas. The RSL-2701S has a maximum laminating width of 27 inches. This makes it perfect for working with large items such as maps, posters, banners, and artwork. It's capable of laminating almost 8 feet of material per minute, so your item will be laminated quickly and you can then move on to other things. With this machine, you can use laminating film ranging in thickness from 1 to 5 mil. That way, you can choose how rigid (or flexible) your item will be after it's been laminated. Just be sure to use a roll of film that has a 1" core. Rolls with different size cores aren't compatible with this device. 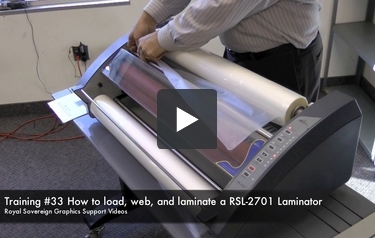 The RSL-2701 is capable of laminating items that are up to 1/16" thick. Therefore, it's possible to work with some mounting boards for visual aids and presentations. This machine has 10 speed settings. The temperature is also adjustable and can laminate at 99 degrees Celsius (210 degrees Fahrenheit) and higher. (Note: you'll need to let the machine warm up for about 8 minutes before you can use it.) The temperature and speed settings are controlled via a digital keypad. Unfortunately, the RSL-2701S can't perform cold lamination. You might need to purchase an additional machine if that's a feature that you need for working with thermally sensitive items. 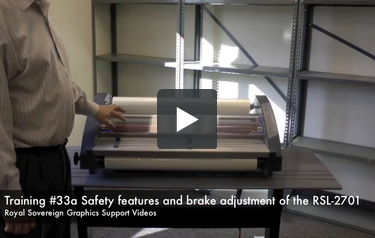 The RSL-2701S has four rollers so all of your items will be flawlessly laminated. With so many rollers, the chances of your work having bubbles or wrinkles is more or less eliminated. If your document gets stuck in the machine, there's a reverse mode that can help you remove it. This device is unlikely to overheat because it has an automatic shut-off feature. This will keep your machine in great shape and save you money in the long run. The RSL-2701S is a pretty big machine that measures 44.5" (width) x 20.7" (height) x 29" (depth). You may want to think about buying a cart for it so it doesn't take up your entire work surface and so you can then move it around easily if you need to. As you can see, the Royal Sovereign RSL-2701S has a lot to offer. It's perfect for working with larger items and it's easy to control. The automatic shut-off feature is especially welcome because it will help keep the device in excellent shape for a long time. (It also eliminates the need for expensive repairs.) While it's a bit disappointing that it lacks a cold setting, this is one laminator that fulfills just about every other need you could possibly have. If you think this is the device you need, get the RSL-2701S today so you can start laminating. You won't regret it.